Day 2 in Antigua has definitely got me relaxed. I started out my day on the veranda of the resort, drinking a cold strawberry smoothie paired with a caprese omelette. I spent the majority of the morning on the beach, searching for starfish and walking along the sandbar in the turquoise water. As the afternoon came, I grabbed a quick bite to eat, a lobster wrap with avocado (incredible), then back to the room. I indulged in a hot stone massage later in the afternoon, and completed my day with a jerk chicken cookout on the beach. It's definitely hot here in Antigua when in the sun for long periods of time. 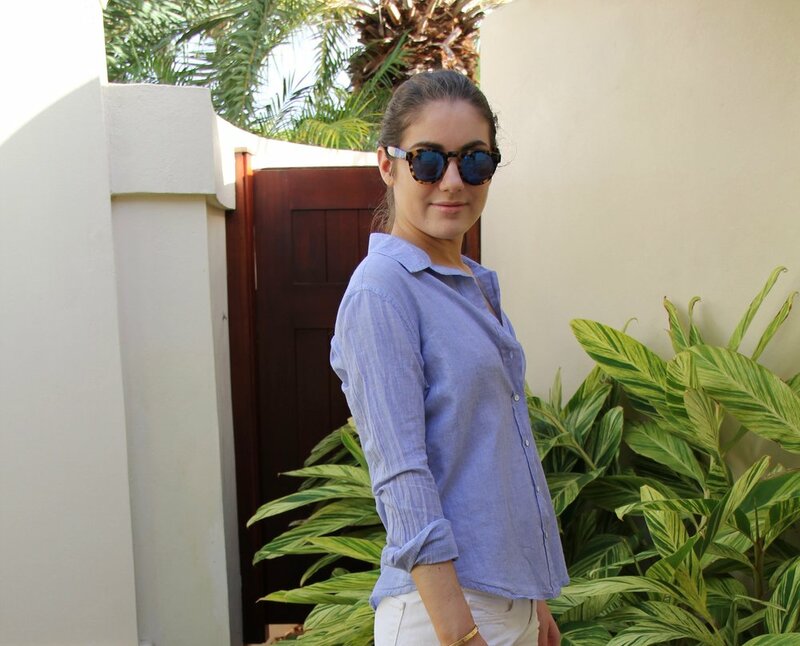 I paired this lightweight button down with my favorite white denim shorts. The sunglasses, a new purchase from Illesteva, have been extremely practical and fit in with the tropical surroundings perfectly.